Still, given the sheer number of islands, resorts, and resort packages, even a veteran vacationer can get overwhelmed. This, dear traveler, is where we apply some research. "Do your homework and prioritize what's important to you," Sandy Lovick, the owner of Minneapolis-based Travel Leaders, told me. "If it's about price, we're finding that Puerto Vallarta and Punta Cana are still really competitive." 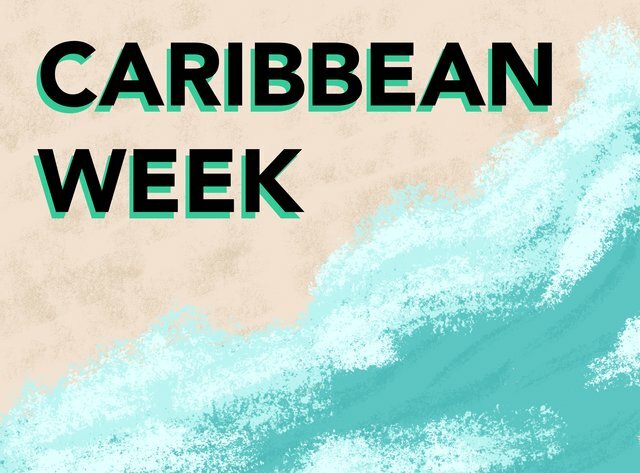 Costa Rica, Jamaica, and Panama are also seeing a rise in popularity, she said: "These places are offering five-star service at a more affordable rate than other Caribbean islands." Once you nail down your port, picking the right resort means sweating a few details. Read the fine print, and don't assume that "all-inclusive" means everything is free. Prices, and what may or may not be included, run the gamut. Your best bet is a low-cost all-inclusive, in a place where you don't feel guilty about eating out when you want to. Resorts that do things a la carte -- meaning you pay out of pocket as you go, on top of the room rate -- are a fine option for the discerning traveler who wants more control over the experience (and budget). 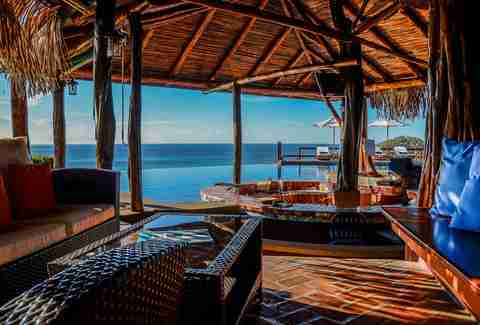 And of course, if "a la carte" and "all-inclusive" are just frivolous concepts to you, there's no shortage of mind-jumblingly luxurious resorts where you can mentally round every transaction to the nearest thousand dollars. Here are the best resorts at every price point (from $ to $$$$$) to get a traveler on any budget started. 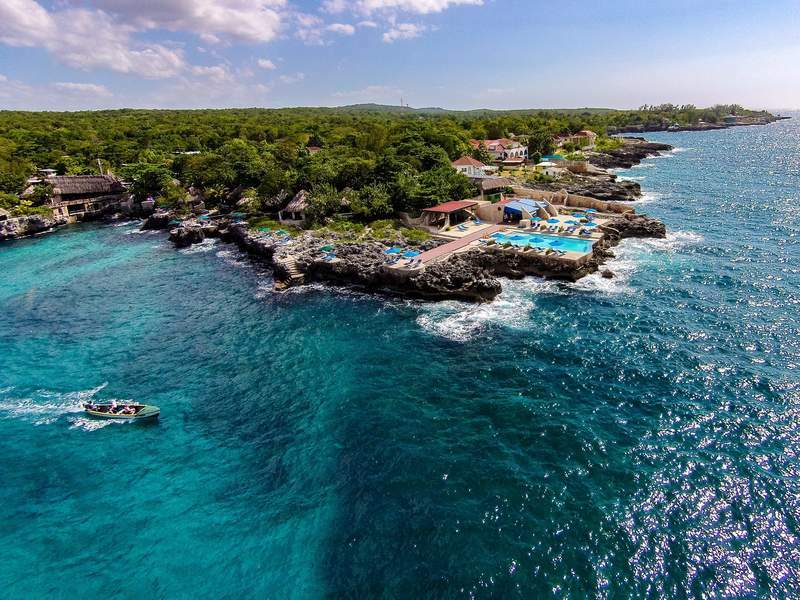 Rockhouse Hotel is one of the coolest Caribbean resorts out there, and not just because the prices are surprisingly reasonable. 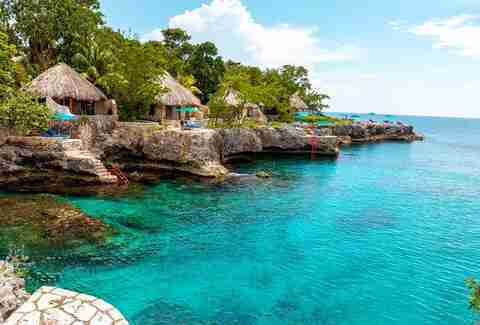 Perched on the scenic cliffs overlooking the Caribbean Sea of Negril's Pristine Cove, this boutique hotel on eight acres of tropical gardens has world-class dining, spa programs, and activities that celebrate Jamaica's culture. Ladders and stairs carved into the rock provide easy access to the water where guests can snorkel and swim all over the property. Rates start at $185 per night during peak season and $95 in the off-season, a relatively modest rate to indulge your thatched-roof cliffside hotel dreams. 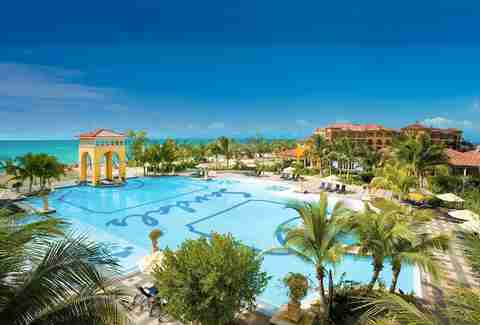 Located in Aruba's capital city, Oranjestad, this resort offers two types of accommodations: the family-friendly Renaissance Ocean Suites and the adults-only Renaissance Marina Hotel, starting at $179. That's a super-affordable rate if you want to get away from screaming toddlers, compared to other adults-only hotels in the area (Bucuti & Tara Beach Resort starts at $350). Throw in free breakfast and a newly revamped private island that's only accessible to guests of the hotel, and you've got yourself a deal. 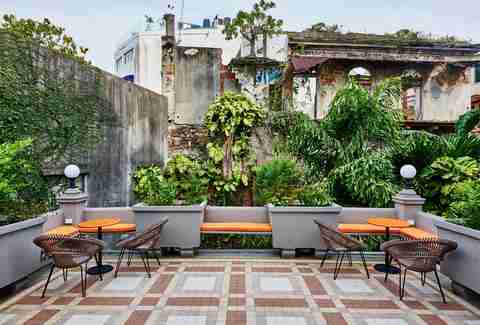 Originally built in the 1930s as an apartment building, this stylish little hotel is in the heart of Panama City's Casco Viejo, a stone's throw from historical sights, shopping, and fine dining. The hotel has nine huge suites and wraparound balconies. The standard rates may seem high by Panama City standards, starting at $180 a night, but the rooms are probably bigger than most NYC apartments, and the charming vibe makes this a better option than the neighboring Hilton. Rosalie Bay Resort sits between 22 acres of lush rainforest and beautiful beachfront on one of the most unspoiled, underrated islands in the Caribbean. 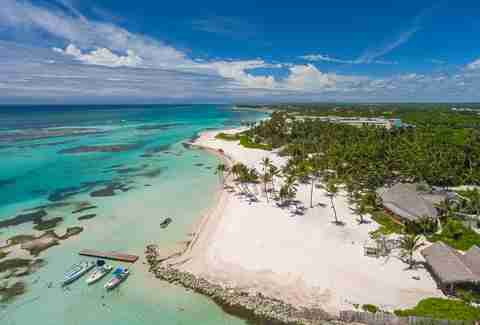 The property is powered with wind and solar energy and the hotel's beachfront is a nesting and hatching site for indigenous sea turtles. Rooms start at $225, which includes Wi-Fi and an organic breakfast -- everything else, like the waterfront spa, is a la carte. 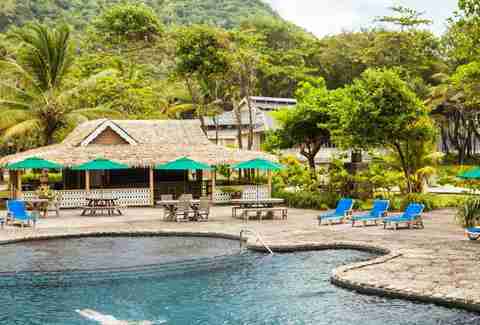 You won't find many five-star hotels or all-inclusives on Dominica -- the more luxe option, Secret Bay, is considerably pricier starting at $499. Hotel Punta Islita, a Marriott Autograph Collection property, may not be all-inclusive, but the bang for your buck lies in all the free activities it offers, like canopy zip-lining, hiking, sea turtle-watching, horseback riding, monkey safaris, cooking lessons, golf clinics, and even art sessions that let visitors collaborate with local artists on a mosaic. Prices here start at $332 per night. 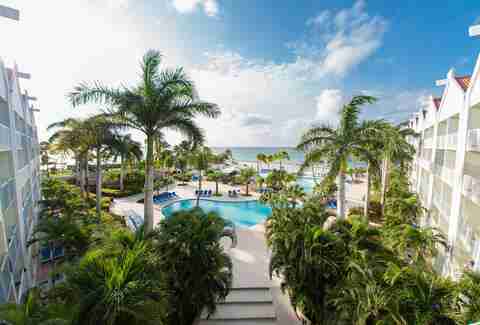 Located along a 50-acre stretch of stunning beachfront property, Sandals South Coast (formerly Sandals Whitehouse) includes access to five on-site restaurants and a jerk shack with all dining, premium beverages, and gratuity included. Also in the deal are water sports and unlimited diving for certified divers -- a huge money-saver as any avid diver can attest. Rooms are all ocean-facing and start at $212 per person/per night. 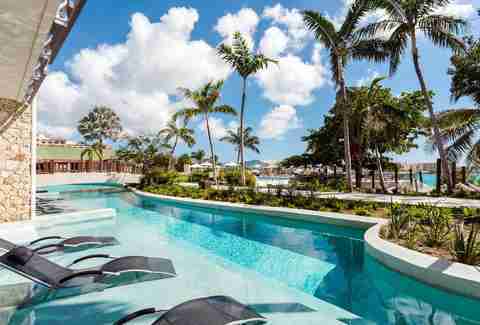 On the southernmost point of the island in St. Maarten (the Dutch side), this ultra-luxe resort offers a pretty killer package with three pools, three bars, a Mediterranean Azul restaurant, 24-hour room service, wellness treatments, and your own private concierge. It's also one of the most uniquely designed hotels on the island. Starting rate is $270 per person/per night. If you're looking for something on the French side, Hotel Riu Palace St. Martin's rooms start at $232, which includes access to the Anse Marcel Marina. 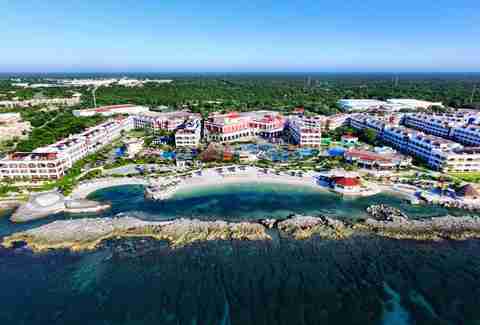 Just off the azure waters of the Caribbean Sea, Hard Rock Hotel Riviera Maya offers an all-inclusive package that's hard to mess with. At your disposal are nine world-class restaurants, eight bars, and decadent lounges. The 1,264 ultra-lavish guest rooms, expansive outdoor pools, and private beach access seal the deal. Starts at $400 per night. If your plan is to nap on the beach all day, this is the wrong resort for you. 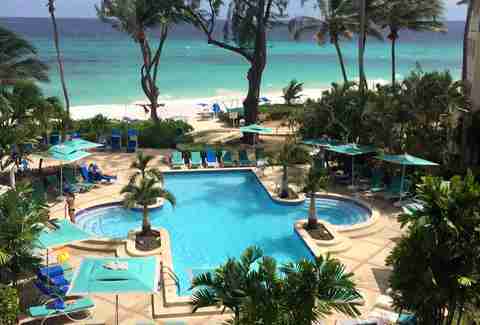 Included in your stay here are a variety of quirky activities you won't find elsewhere: rum shop crawls, a tour of the famous Oistins Fish Market, a pastry-making class, and beach cricket (Barbados' sport of choice). Pair that with unlimited snorkeling, surf lessons, stand-up paddleboarding, and daily fitness classes, and you've got a pretty solid all-inclusive with something to keep everyone in your squad entertained. Rooms start at $396 per room per night. 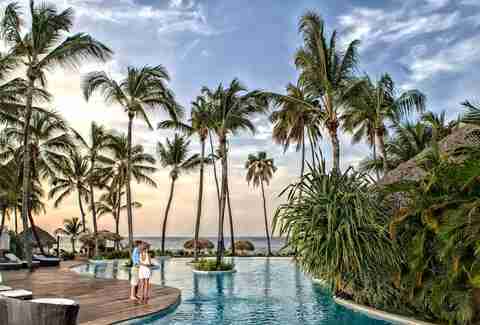 White sand beaches, top-shelf liquor, yoga classes, horseback-riding lessons... Zoetry Agua Punta Cana unrolls a ton of options at five-star quality. This is considered to be one of the most high-end all-inclusive options with prices to match at around $600 per night and up. Eliminate any additional charges or gratuities when you scale up to the "Endless Privileges" package, where gourmet meals, Wi-Fi, and the mini-bar are included. 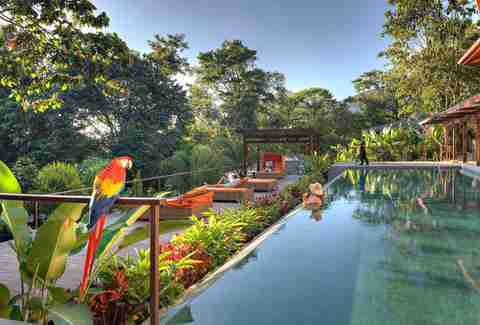 In the heart of Arenal Volcano National Park, Nayara Springs is an adults-only resort with 19 newly refurbished villas, private hot spring pools, a yoga pavilion, and a swim-up bar. While breakfast and free yoga sessions are included, it's a la carte-only otherwise. The rooms are rustic and 1,500sqft -- that ain't small. The cost per night will run you around $590. Nothing screams over-the-top luxury like a private island. 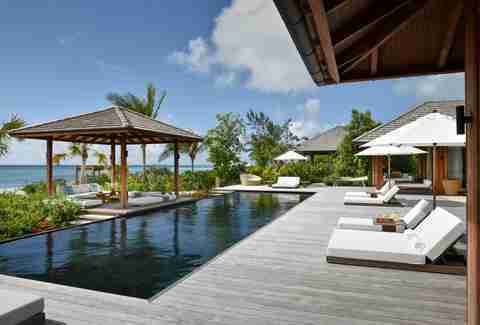 Guests get their own private pools, 24-hour personal butlers, and 1,000 acres of beachfront to roam. One of the biggest draws is the Asian-inspired therapy and wellness program at the COMO Shambhala Retreat, which emphasizes yoga, beauty treatments, and "enzyme-rich" cuisine. Prices start at $650 per night. 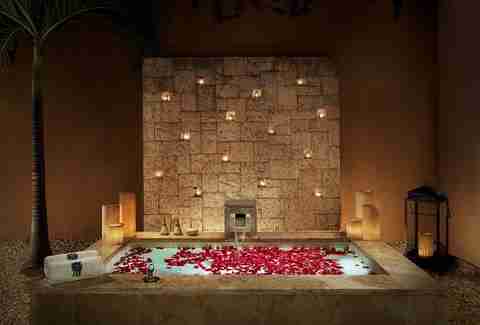 If massages and facials all day, every day sounds like a thing you might enjoy, Banyan Tree Mayakoba recently launched its Spa Sanctuary Villas, where guests enjoy unlimited treatments. Sanctuary hosts create a custom-tailored itinerary for guests when they arrive, but each day begins with a morning delight treatment, followed by an in-villa wellness breakfast. Go back for additional treatments at your leisure throughout the day. With therapists on hand offering unlimited massages from a menu of 10 treatments, it's not insane that the Sanctuary Spa Villas starts at $1,399+ per night. Comprised of 13 secluded beachfront villas decked out with decor and designed by Oscar de la Renta, Tortuga Bay comes replete with your own private villa manager, private beach access, award-winning Bamboo Restaurant, and your own golf cart to get you around the resort. Rooms start at a bifocals-adjusting $1,500 per night. 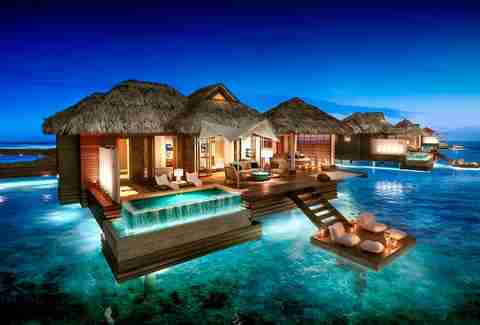 Sandals Royal Caribbean just unveiled new overwater villas in December. With not one, but two private butlers, glass-bottom floors, private wading pool, and an electric boat named Duffy (of course) to shuttle you around, rooms don't come cheap. Prices start at $1,435 per person/per night for the overwater villas and word on the street is there are 12 more bungalows coming soon. With in-room dining available 24 hours a day, the real value-saver here is flight time and costs. Direct flights from New York are just over three hours, compared to the time and money it would take to fly to the Maldives. Michelle Gross is a travel, food, and culture reporter based in Jersey City. Her latest claim to fame is walking across the Tijuana border in size 11 men’s running shoes without tripping. Follow her on Instagram @mtothegnyc.